Micro-entrepreneurial activities play a pivotal role in rural economic development in the third world countries. As a result, in Bangladesh poverty alleviation through rural centric micro-entrepreneurship development has been focused for more than thirty five years. Over 600 registered and thousands unregistered microcredit organizations including globally prominent institutions like Grameen Bank, BRAC, ASA, BARD, ActionAid, CARE etc. are operating here with their own reputed models. However, the micro-entrepreneurship development and its achievements in the country are still lagging behind a satisfactory level due to a number of prevailing factors. This book examines its major achievements and shortcomings from the perspectives of the structured institutions, non-structured institutions, and non-institutional factors, and government‘s policy guidelines influencing development of micro-entrepreneurship, and makes recommendations for overcoming the shortcomings. Alam, M.M., Molla, R.I., and Hossain, M.M. 2010. 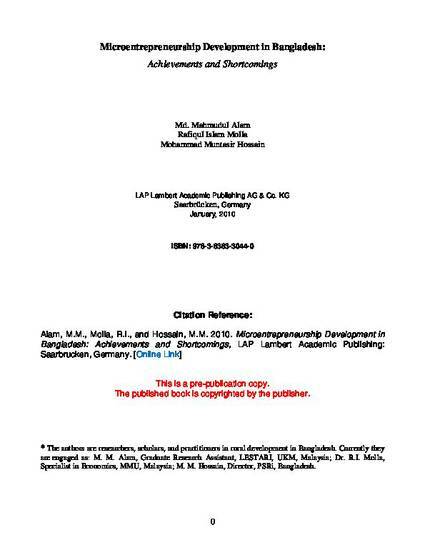 Microentrepreneurship Development in Bangladesh: Achievements and Shortcomings, LAP Lambert Academic Publishing: Saarbrucken, Germany.